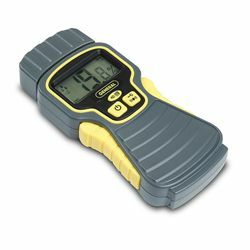 Prevent mold and detect leaks in wood, concrete, plaster and carpet with this professional and accurate moisture meter. With an accuracy rating of +/-3%, it can tell you if the substance you're testing is in a low, medium, or high saturation range. It can help with inspecting new homes, locating roof leaks, or even selecting dry lumber at the yard. Includes protective cap. Requires 9V battery, included.